So about 3 years ago i totaled my rx8. My mistake was i took a turn fast on old used 60psi aired up rear tires which led to the guardrails. I learned the hard way. Fast forward to now I'm still trying to build an rx8 I dream of. Maybe one day this one will be the way i dream of. Im 17 and im buying an rx8 asap just after i make 7k (im at 4k). I live in canada where its winter 6 months a year and disgustingly wet another 4. How do you suggest i get the most fun out of a rotary? Personally I drive my car year round, but then I don't have to deal with snow on a regular basis, and winter tires work just fine. But yeah, get an old Corolla/Civic/Accord and start there. Get one in stick and it should be fun enough for you to not fall asleep. RX-8 won't work for you well if you are on a budget. I already drive a corolla. Corollas are boring and i already topped its speed in pretty much any terrain. I snore when I drive. Honestly why do I always get this response in this community. What the **** else am I suppose to drive that's fun? - MR2s are pieces of **** for cornering (I will end up drifting it probably and we all know how demanding it is to drift an MR2). 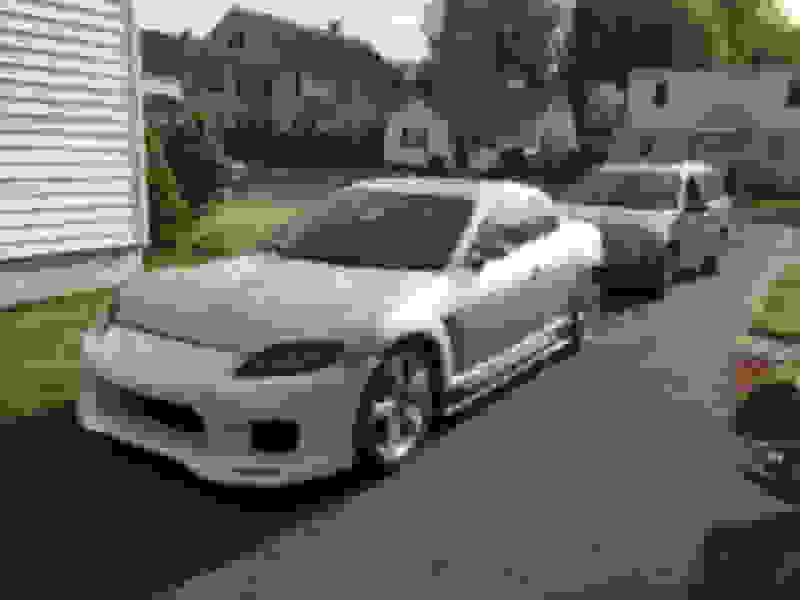 - Ford Crown Vic has all the problems the RX8s have plus all the problems the Mazda3s have. Out of budget range after all the repairs I bet. What am I missing? I really want something RWD or AWD, something fun and cheap, doesn't have to be fast stock but a little power with a little money is fine. 4 seats would be amazing! Because it's irresponsible for us to just give you the blue pill. An RX-8 may be cheap, but it's not necessarily cheap to keep alive and running in top condition. The gas mileage, for example, is basically V8 level, and you have to feed it premium. I had a 99 Corolla 5-speed. As crappy as it was, it did double the MPG as my 8 with ease. And have you actually got quotes for insurance for an RX-8? Yes, I have heard that some insurance companies count it as a 1.3L 4-door car and it's, therefore, dirt-cheap to insure, but most people have said that's not the case in their experience. In my case, my RX-8 is as expensive to insure as the 08 Accord Coupe V6 I had. If you have to pick from the bunch, go for the Miata, then have your name listed under your parent's insurance policy(that's what most high school/college kids do). An old Civic Si is also a fine choice, and you get the practicality. Sorry if I am being blunt, but at the same time, I don't want you to regret your decision. And import duties. And sh*t exchange rate. I have heard that, as greedy as ICBC is, new drivers in BC actually pay less compared to new drivers in other provinces in Canada. Your forgot the RX8s actual competition: m3, 350z and s2000. You can have plenty of fun with an 8 in any weather, by going out and driving it, and getting involved in motor sport. From Ottawa you can get to Tremblant or Calabogie within 2 hours, both fantastic tracks. In the winter, go ice racing, you'll learn a lot "in any terrain". So I don't know what you're supposed to drive, nobody came here to solve that problem for you. Don't assume that because this is an RX8 forum, we automatically want you to have an 8. Based on how you have judged the other cars, it's probably best for everyone if you didn't. If OP has the budget for those, then I think he'd include the BRZ/FR-S/86 in the list as they are pretty much the go-to drift cars. An old M3 might be cheap, but then again you are dealing with an old German car and that's not cheap to maintain. Even the cheapest S2ks start at CAN$15k from what I have seen. 350Z's probably equally expensive, and yeah, have fun with the crappy Nissan interior. But I do second the motorsport idea. Just go to an AutoX event. You can join with even just a Corolla(it's open to pretty much any car). Great place to have fun, hoon around and make friends. You can also talk to owners of the cars you mentioned and see what they say about their cars. Make for a great conversation piece. And the last bit goes for any good car forum. Edit: Actually, here is a suggestion: A 7th Gen(2003~2007) Honda Accord V6 Coupe 6-speed. Not too shabby w/240BHP, not too expensive, and Honda J engines are bullet-proof. It's not as good handling as an 8, naturally, but you can still have fun in it and definitely not fall asleep. Last edited by UnknownJinX; 06-19-2018 at 10:52 PM. Yeah, honestly if I had the money I'd go with a used FRS and give it a 3SGE swap... But obviously to start off with I dont have the money. Yall know my money is in CAD right? Anyways, I also really like the rotary design and kinda like a cartoon I respect, I wanna own something of the wankel engine... I've had people suggest me to swap it with a 13Bt or a REW and it'll do plenty of reliable power. I feel like we've gone really far from the original thread's talk so let's bring it back. Let's say I drift an RX8 with a 13Bt making 300hp... What kinda tyres you guys suggest me? At what point would the tyres need to be larger than the body (which means widebody time)? Nobody is stopping you if you want an rx8 as a drift car get one. Mods coilovers, welded diff and bucket seat then drive a ton of events because seat time is everything. Just know replacing a rotary and swapping motors isnt cheap. So having a spare vehicle is a good idea.